There is, at least in part, some truth to that image. The weather and environmental conditions of Brazil mean that many kids still play a lot of football in such spaces. But, as with most stereotypes, there is also a significant dose of lazy generalisation in those ideas. Football might be ingrained in the Brazilian soul but it does not mean that youth training in Brazil has remained a question of chance where clubs expect natural ability to be magically developed on the streets. Instead Brazilian clubs work extremely hard at ensuring that whatever talent they come across gets fulfilled. It is no accident that Brazil has, of late, started to deliver not only exceptional attacking players but even goalkeepers and defenders. And all this work often goes by unheralded due to the belief that players turn up at their doors fully developed. Despite all of that, there is an increasing acceptance that part of the game that made Brazilian players distinctly Brazilian was down to players’ formative years and the hours of free play they amassed. Equally, there was the realisation that as society changed and such games decreased something needed to be added to their training to replace this growing gap. Increasingly they have been turning to futsal to fix that problem. Although originally developed in Uruguay, this condensed version of the game of football that sees two teams play each other in a much smaller indoor pitch, rapidly spread to Brazil in the 1940s. Much of Liverpool success in the 1970s and 1980s was down to their regular five-a-side game through which they fostered the club’s famous pass and move style. It was not something done consciously – at least from the players’ perspectives – but it built in them a way of seeing the game that they replicated on a weekly basis. In the 1990s, the Italian manager Corrado Orrico developed a gabbia (literally: cage) where his players could train. This was an enclosed space were the ball never went out of play and players had to constantly move and harry each other. Orrico was one of a new wave of Italian coaches who professed the need to press hard in order to win the ball, rather than a system based on the more traditional Catenaccio style of Italian defending. For him, getting players to train in this environment was the ideal way to prepare them for a system that required stamina and which overcame technical limitations (of the players) through their ability to work hard. And it worked; Orrico managed to improve a number of smaller clubs – like Sarzanese, Carrarese, Massese, Udinese, Lucchese – through his use of this altered form of futsal. The great football writer Jonathan Wilson is fond of reminding people that in football nothing is ever really new but, rather, a different take on what someone else had done before. The same is true on futsal’s recent popularity within the mainstream game. These days practically all of the high level Brazilian clubs have their own futsal sides where kids that enrolled with them get to play and they keep on doing this until they are around fourteen. The likes of Neymar and Coutinho played the game in their youth and the skills they developed there can be seen in their game to this day. In futsal, you see whether a player is really talented… you notice the small details in quality, class and tactical understanding. For anyone who has ever witnessed a game of futsal, the benefits are immediately obvious. Despite the reduced numbers of players, the restricted pitch size demands quick thinkers. There is no time to calculate what to do with the ball; if you want to retain possession you either pass it to someone else on your team or else you find a way past whoever is blocking your path. The latter option is what makes futsal such an enjoyable game. Players often resort to tricks and skill to make some room in which they can move. This makes close control of the ball vital as well as boosting players’ creativity that blossom in the form of tricks that they can pull off. That the game is played with a slightly smaller ball further facilitates all of this. In an interview back in November of 2012, Cristiano Ronaldo said “During my childhood in Portugal, all we played was futsal. The small playing area helped me improve my close control, and whenever I played futsal I felt free. If it wasn’t for futsal, I wouldn’t be the player I am today. ” Or, as Pele had earlier explained, “futsal makes you think fast and play fast. It makes everything easier when you later switch to football.” Ronaldo and Pele are right in crediting futsal for some of the greats’ abilities. As with anything, however, it is not a miracle solution for the development of skills. Not by itself. Focus too much on futsal and players will become extremely good at it. There’s nothing wrong with that, obviously, but that is not what professional clubs want. Futsal is a great game to teach the fundamentals. It teaches players how to think quickly, how to scan their surroundings rapidly to know where they need to pass the ball, to pull off tricks that can free them. All the things that are more difficult to coach on a big pitch. Yet, they need to play in bigger pitches as well. This is crucial for them to understand the mechanics of playing eleven-a-side football, how tactics work and the moves they need to make. Not to mention the stamina and physical attributes that are needed to handle running on a bigger pitch for ninety minutes. As the players grow older and the basic skills of futsal have been absorbed, then they need to focus their energy on the real thing. 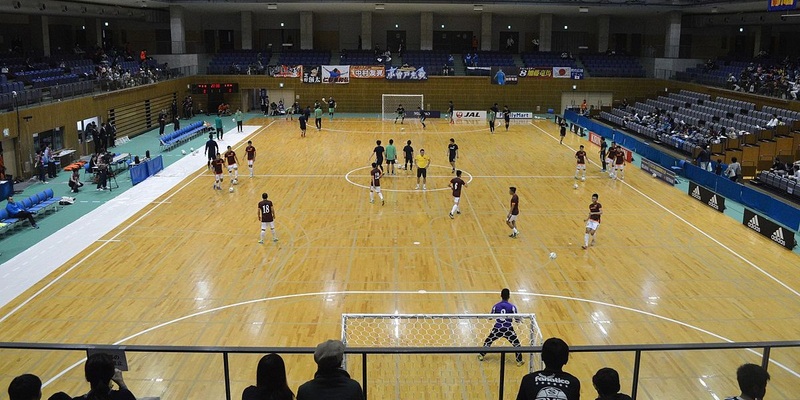 The big question, then, is whether futsal and regulation football can co-exist? The answer probably lies in Brazil where clubs start to transition players from futsal the more they start to get into their teens. The danger lies in a player becoming overly specialised in futsal to the extent that they are lost to the bigger game. Brazil have found their balance and, given that their system has helped develop two players who over the past twelve months were transferred for a combined €340 million, it looks to be working.